Merlebach is a former coal mine located in Lorraine (France), that is targeted to be exploited for low-temperature geothermal energy production. A 3D geological model of this mine has been build thanks to a subtle combination of various techniques available in RING's plugins : GeolToolBox for data management and georeferencing tools, StructuralLab for implicit modelling, Tweedle for surface remeshing and Gopy for automation of Surface extraction. The final surfacic structural model is composed of the topographic surface, 13 faults, the Permian overburden bottom surface and the 71 irregularly stacked, very close and very thin, sub-vertical coal beds. On these surfaces, the exploited parts of the coal beds, now filled by sand, have been individualized. 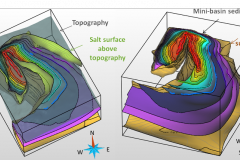 The 3D surface-based geological model, in which infrastructures can be inserted as piecewise lines, can be volumetrically meshed. This work has been recently published in Computers & Geosciences on the title "3D geomodelling combining implicit surfaces and Voronoi-based remeshing: A case study in the Lorraine Coal Basin (France)". The 3D surfacic model is free for download here. Please cite the corresponding publication : "Collon P., Steckiewicz-laurent W., Pellerin J., Gautier L., Caumon G., Reichart G., Vaute L. (2015). 3D geomodelling combining implicit surfaces and Voronoi-based remeshing : A case study in the Lorraine Coal Basin ( France ). Computers & Geosciences, 77(0), 29–43."